The best (and shortest) business book ever written. Why visualizing your success could actually be hurting your chances for success. The #1 overlooked skill for every author, and how to get 7,000 Twitter followers. 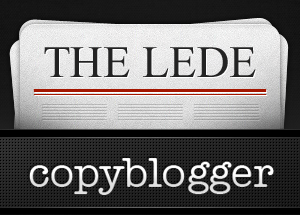 Oh yeah, make sure to follow @copyblogger on Twitter to grab these links — and a lot more — every week. Well, now they’re written. This is a very good and basic structure for operating effectively within any social media. You’ve heard about this author all your life. You’ve probably even quoted him a few times without knowing it. Have you read his amazingly practical business philosophies? The word counterintuitive doesn’t begin to describe the results of this research. What do you think? You do know that not everyone is opening your emails right? Number 4 is a bit vague in its counsel, but there’s a lot of solid, specific advice in this list to help you along in your email marketing. The lesson in this story lies under the surface. This is not necessarily a tactic to be replicated, as much as a philosphy to keep in mind: Strategically enter the conversations that matter to your business goals. A powerful observation made by well-respected writer and editor Jane Friedman. Copyblogger hasn’t been teaching this stuff for almost six years just for the hell of it, it really matters. I would promise not to link to Seth in every edition of The Lede, but that could very possibly become a lie. There’s just too much in his archive that needs to be read, spread, and understood … like the link above. Did you miss anything on Copyblogger this week? Are Internet Idiots Annihilating Your Productivity? Robert Bruce files unusually short stories to the Internet nightly, from an undisclosed location near you. Previous article: Are Internet Idiots Annihilating Your Productivity? Thanks Robert for share this list. I wont ignore (of course) – I think I will learn so much from all marketing link above. I go to read all right now. These r stuffs we have heard said overtime but we just seem to ignore them unconciously,This post is really a food for thought,Thank You so much for sharing. Very useful list. The twitter and email marketing articles seem to be the best. Thanks Robert! Printing these now for bed tonight. Looks like a great list. Can’t wait to apply some of these techniques! What a worthless piece of advice from Seth. I seriously doubt he uses his own advice that he spouts off so freely here to get publicity for himself, and his books. Sure, if you sell ten people your product and they like it and they tell ten more and they tell ten more it’s great… but don’t be the ranch on this as your marketing plan. Note the word “First” in the title of Seth’s post. I was thinking that his advice is extremely good as a beginning (not as an entire marketing plan), when I offered this link. Nice to know that when you ask someone to speak their mind, you listen – and allow posts of all natures, both good and bad. I enjoy your writing and lots of great tips – so thanks. But, call me cranky – I didn’t like this one. I certainly agree that starting a viral marketing campaign is awesome – tell a friend, they tell two friends, they tell four friends… but as a professional marketer I also don’t think this is a realistic part of a real marketing plan or that it happens in this simplistic path. We all hope our products and services are good enough for clients to tell others – and I do believe this is the highest level of trust you can establish and probably the most effective of all marketing methods: referrals. No doubt. Can we get lucky and can the viral happen? Possibly. But… not likely. Please don’t take the one or two examples of success and say “Look! That it happened here.” That’s like pointing at your child and saying sure – you can be President – it happened to Obama! Or when you kid plays piano knowing how he’ll be successful just like Billy Joel. Sure, it can happen. But, that’s not the way to bet. How about pointing to the hundreds of thousands of failed businesses that started on the same “tell a friend” campaign. Look at all the underlying hours and manpower it takes even large well-known company campaigns to move from a dead start. Hundreds, thousands of hours gearing up to get Facebook “likes,” and now the same with getting Google +1. Everyone is clamoring for you to “follow them” or “link” to them, “vote” for them, “like” them. It’s work and effort. Do you think Pepsi put two hundred dollars into the kitty and said let’s go viral – it’ll happen because a lot of people like our product!” I don’t think so. I’m not saying the “tell a friend and they’ll tell two friends” isn’t a good start to any campaign, heck it certainly seems to happen fast when I create a piece of work with a typo in it. I’m just saying it’s lousy advice to a new firm who needs to hit the ground at speed, or a guy with 6,000 surf boards in his garage hoping to sell them before the winter. Thanks for posting this. I think it’s exactly how Seth started out when he started out as a public figure. He doesn’t take out a superbowl ad to sell his books, he uses the authority platform that he created years ago and has been building on steadily ever since. Seth’s audience, and Copyblogger’s and many others, are what the result looks like some years into the game. I ignored them. Call me crazy. What a great resource, thanks! Just bookmarked this page!! One thing is common between all the post. The title they have used is great. I agree. I went to the how to get 7,000 twitter followers one. I didn’t find what I was looking for, but I wasn’t disappointed either. The title sucked me in. I would have to say Seth Godin link to me seemed to be the best one. It seems That I can see that approach in soo many other business structures. I love the twitter story!